In 2008, the National Highway Transportation Safety Administration (NHTSA) reported 144 fatal crashes with large trucks in Illinois. The fatalities from Illinois truck accidents placed many of the state's counties in the upper echelons of crashes in the United States, where 677 truck drivers were killed, 4,229 passengers were killed, and 23,000 were injured in similar trucking accidents. 18-wheeler truck accidents are serious and deadly. A collision with a large truck is devastating for the driver and any passengers of a car. The truck's sheer size and power leave the car with little chance of minimal damage. Truck drivers, their employers, and their insurance companies do their best to minimize any truck accident settlement. That is why it is crucial for you to consult a highly experienced and focused truck accident lawyer in Chicago before you speak with anyone connected to the truck driver. The insurance company makes attempts to offer you a settlement that is not in your best interests. The adjuster's job is to settle, settle quickly, and settle inexpensively. That is why it is crucial to call Power Rogers & Smith. A Chicago attorney from our firm will work with a dedicated team of accident reconstructionists, specialists, and technicians in addition to your witnesses to prove truck driver negligence and liability. 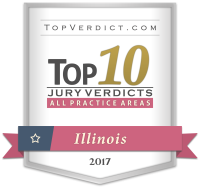 When you engage us to file a truck accident lawsuit in Chicago or elsewhere in Illinois, know that you are receiving the talents of some of the most influential legal minds with a passion for helping trucking accident victims. You have a limited amount of time during which to file your truck accident lawsuit. Your Illinois truck accident settlement depends on meeting all deadlines. Power Rogers & Smith can explain how the statute of limitations applies to your specific case and help you stay within the limits. Illinois residents rely on Power Rogers & Smith, the Chicago lawyers, to maximize their rightful compensation. Contact the firm today to schedule your free consultation and tell us about your Illinois truck accident.